You can now download the Wii Netflix Channel to get your movies beamed directly to your brain over the intertubes. That's right, no disc required! 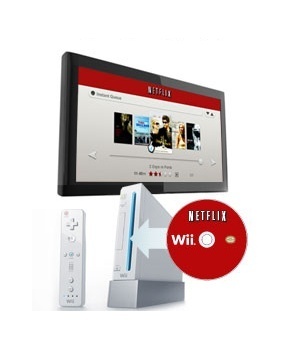 Previously, Wii-users and Netflix subscribers were able to stream "Watch Instantly" movies to their little white console with a special disc. That clunky service debuted this March, but now, only 8 months later, Nintendo has made the Netflix Channel available for free download in the Wii Shop Channel. You will still need a Netflix subscription of at least 1-disc out at a time or $8.99/month. Wii-users are then further limited by the resolution available but thankfully most of the "Watch Instantly" back library isn't HD capable anyway. Sony is also rolling out its disc-less Netflix service on the PS3 later today, allowing all current-gen consoles the ability to stream movies instantly. Xbox 360 owners have enjoyed Netflix streaming since 2008, but that didn't stop Nintendo from saying that the Wii was all about family time. "At this time of year, consumers have a near-insatiable demand for family entertainment," says Reggie Fils-Aime, president of Nintendo of America. "And this simplified Netflix access will help bring families together more quickly, more easily and in more ways than ever before." Netflix is just as excited as CEO Reed Hastings says, "The availability of Netflix right on the Wii Menu adds significantly to the ease and convenience that attracts our members to the Netflix streaming experience and is an important step in our efforts to continuously improve the service." I hope that Netflix improves its interface for finding movies to watch via consoles other than watching what's on your "Watch Instantly" queue. I don't know if the Wii or PS3 will allow the fancy searching through Netflix library that Susan Arendt discovered in her preview of the upcoming Xbox 360 dashboard update, but that would be a big step towards making the service that much more awesome.